We’d love your help. Let us know what’s wrong with this preview of Blizzard of Love by Erin Wright. A country boy who hates Christmas for a reason, dammit … When Luke Nash runs into Stetson Miller down at the feed store, he never expects his friend to strong-arm him into spending Christmas at the Miller farm. Luke has no patience for Christmas cheer or Yuletide song. And the rugged cowboy definitely has no desire to kiss a girl under the mistletoe. No matter how infuria A country boy who hates Christmas for a reason, dammit … When Luke Nash runs into Stetson Miller down at the feed store, he never expects his friend to strong-arm him into spending Christmas at the Miller farm. Luke has no patience for Christmas cheer or Yuletide song. And the rugged cowboy definitely has no desire to kiss a girl under the mistletoe. No matter how infuriatingly pretty she might be. To ask other readers questions about Blizzard of Love, please sign up. I purchased this! cannot get it to download. Could you please assist me? A winter storm that promises to be the storm of the century. A Christmas loving city girl. A Grinch like cowboy that thinks he is fit for the senior's complex (even though he is 26). All of these combine to make a Hallmark Hall of Fame type vibe with lust turning to love pretty quickly since it is a novella. "Will they make it through the Storm of the Century? Can the magic of mistletoe tear down the barriers between them?" Very good questions both of them (don't want to give away the answers but they are fun to read) Luke so needed to get out of a funk that was making him feel 50 vs his actual 26 years. Bonnie was missing her family and looking to find her usual love for Christmas time. These two are so fun to read and loved the descriptions of Long Valley. This story makes be desperate to read the "Will they make it through the Storm of the Century? Can the magic of mistletoe tear down the barriers between them?" Very good questions both of them (don't want to give away the answers but they are fun to read) Luke so needed to get out of a funk that was making him feel 50 vs his actual 26 years. Bonnie was missing her family and looking to find her usual love for Christmas time. These two are so fun to read and loved the descriptions of Long Valley. This story makes be desperate to read the first book to get the story behind Stetson Miller and Jennifer. I have enjoyed all of Erin Wright's Long Valley stories and this one is a special treat set at Christmastime! It can certainly be read as a standalone but I really urge you to read the rest of the stories in the Long Valley series - they are all great! In Blizzard of Love, Luke Nash, a farmer in the Valley who plans on spending Christmas alone, accepts an invitation from his best friend, Stetson ("Stets") Miller to spend the holiday weekend with Stets and his wife, Jennifer. As Luke's best frie I have enjoyed all of Erin Wright's Long Valley stories and this one is a special treat set at Christmastime! It can certainly be read as a standalone but I really urge you to read the rest of the stories in the Long Valley series - they are all great! In Blizzard of Love, Luke Nash, a farmer in the Valley who plans on spending Christmas alone, accepts an invitation from his best friend, Stetson ("Stets") Miller to spend the holiday weekend with Stets and his wife, Jennifer. As Luke's best friend, Stets knows Luke didn't have any plans and was just going to be home alone. Jennifer, in the meantime, unknowing that Stets has invited Luke, extends an invitation to her best friend Bonnie, an accountant who lives in a large city about 90 minutes south and is also alone for the holidays, to join she and Stets for Christmas. Let me say right now that the way that Luke and Bonnie meet for the first time is hilarious! City girl and country boy - both making assumptions about the other. Things get even more complicated when Stetson, Jennifer, Luke and Bonnie find themselves snowed in and with no power. After a long night of everyone huddled in their sleeping bags in front of the fireplace for warmth, things begin to heat up between Luke and Bonnie. But Bonnie lives in the city miles from Long Valley and Luke owns a farm in the Valley. Can the magic of mistletoe and a Christmas miracle bring them together? Such a great feel-good, heartwarming story! BLIZZARD OF LOVE. By Erin Wright book 2 "Sweet Long Valley"
Christmas at the Miller farm, Luke accepted invite, antsy, and the thought of good cooking. He hated the season, the cheerfulness of the people. Bonnie, loving Christmas, and wanting to be around people, snow, with all the trimming, accepts Jenn invite. A weekend get away, turns into so much more, a blizzard, and being stranded together. The defensiveness are high can they be broken down, and an end to loneliness for these two. Readers wi BLIZZARD OF LOVE. 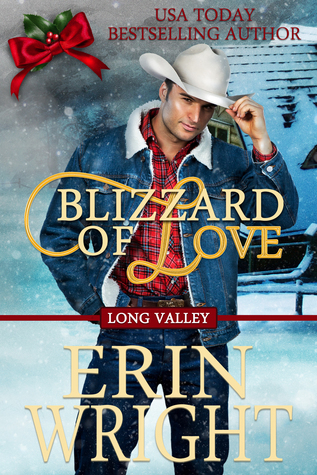 By Erin Wright book 2 "Sweet Long Valley"
Blizzard of Love is a continuation of Accounting for Love but its the secondary characters who star in this book. I love stories that take place in the country, where people live on ranches or farms. This book just makes you feel all warm inside. Luke's friend, Stetson, invites him to spend Christmas with him and his wife, Jennifer. Jennifer I cried her best friend, Bonnie, for Christmas. Although it wasn't planed, Bonnie and Like hit it off, after a rough beginning. Then the blizzard hits, and the four of them, plus Carmelita, the housekeeper, are stuck in the house. Best Christmas ever! Loved the story. Great book. Erin Wright writes lovely novels. This one is exactly the right length for the story but too short for this reader. One of the things I like best about Wright's books is that she writes the narration as well as the dialogue in the voice of the person through whose eyes we view the particular scene. And her characters have their own unique voices. One of the best romance writers on the market today. I just loved this story between the country boy and city girl. Was it planned by Stetson and Jennifer to try and bring Luke and Bonnie together? Or just a happy coincidence that they were both able to visit for Christmas? And of course the weatherman was so off base when he predicted one inch of snow that actually turned out to be a blizzard. It was great seeing more of Carmelita, the Miller's housekeeper/cook. You don't want to miss out on this story. This was a nice quick holiday read. It can be read in one sitting. It has the magic of the season for Luke and Bonnie. Their first time seeing each other is very memorable and funny. They're opposites when you first look at it, but there is more then meets the eye. Bonnie's love of Christmas is like mine. I'm that Christmas person in my family. If you're looking fora good story during the holiday season I would highly suggest this one. I really enjoyed this Western Romance. I received this book as a gift and I voluntarily chose to review it. I've given it a 4.5* Rating. This was a fun short Christmas read. These two characters didn't know what hit them but soon found out about the time the storm hit. Lots going on in this, part of it Christmas fun and a silly dog. Not for the under 18 readers. This story Went by too fast but, Bonnie and Luke are trapped together in a blizzard. Stuck with their two married best friends, in The storm of the century, love blooms warm and bright. These two didn’t start out looking for love but a snowed in cabin in the woods with No electricity and the sparks flew. A sweet satisfying love story. Luke, Stentson’s best friend, and Bonnie, Jennifer’s best friend, are stuck along with Stentson, Jennifer and Carmelita two days from Christmas due to a huge blizzard little they know that love will sparks between them. A sweet love story in Christmas time. I received a free copy of this book and I voluntarily reviewed it. This is a really sweet love story of two people who meet at a friends house and think they would never fall for each other, her being a city girl and he being a farmer. Turns out she hates city life and after getting snowed in they find sparks between them and not just from the fireplace. I received a complimentary copy and I am voluntarily reviewing. I liked that it was romantic without too much cursing and overly naughty bits, I can recommend this to my mother without being embarrassed! Sweet story, I didn’t know there were two versions of this book. I read the tame version, cute nonetheless. Luke and Bonnie stuck in a blizzard at their friends house, over Christmas. Will sparks fly once the power goes out? Love this cute Christmas novella. I read it with the box set, but decided to read it again. Great characters with a cute love story. Short but sweet. City girl falls in Love with rancher in a small town. Love at first sight but how to get together. HEA . ENJOY! An almost clean book. I love when men refuse to think about marriage and tease their married friends. Loved the book. I love Erin's style and how all books are interconnected. You can easily read them as standalone though. I received a free book and voluntarily chose to review it. An almost clean book. I love when men refuse to think about marriage and tease their married friends. Loved the book. Luke Nash dislikes Christmas but he is invited to his best friend Stetson Miller’s place to celebrate with Stetson and his wife Jennifer who has also invited her best friend Bonnie Patterson who loves Christmas, to come . You will laugh , you will worry, but best of all you will fall in love with this story atleast that is what I did ! I am going to see if there is other ones in this series besides the two I have read .I received a free copy of this book and voluntarily chose to review it. BLIZZARD OF LOVE by Erin Wright. This goes along with Accounting for Love by her also. A delightful, funny, story that tests the patience of two people. This story deals with Luke, antsy being on the farm by himself, yet hates Christmas. The noise, cheerfulness of people, is there anything worse, maybe an invite to spend Christmas at a friend's house. If he only knew that a best friend of Jennifer would have invited someone also. His best friend is Stetson, the cooking of Carmelita won him over. BLIZZARD OF LOVE by Erin Wright. This goes along with Accounting for Love by her also. A delightful, funny, story that tests the patience of two people. This story deals with Luke, antsy being on the farm by himself, yet hates Christmas. The noise, cheerfulness of people, is there anything worse, maybe an invite to spend Christmas at a friend's house. If he only knew that a best friend of Jennifer would have invited someone also. Luke hates Christmas and when his friend convinces him to spend it at the Miller Farm, he's none too happy. Bonnie just adores Christmas, and is excited to spend it at Miller Farm. When these two get together, wow, is it incredible. The chemistry is believable, the story enjoyable. I really loved this book, and definitely recommend it. I voluntarily reviewed an Advance Reader Copy of this book. I voluntarily read an advanced reader copy of this book for an honest review. I was recently introduced to Erin Wright's books with Accounting For Love and instantly fell in love with her writing. i feel just as strongly about Blizzard Of Love. In AFL you meet Stetson, Jennifer and Carmelita (she is Stetson's housekeeper that helped raise him). In BOL you have Luke, Stetson's best friend and Bonnie, Jennifer's best friend. Both Luke and Bonnie happen to be visiting Stetson and Jennifer for Christ I voluntarily read an advanced reader copy of this book for an honest review. In BOL you have Luke, Stetson's best friend and Bonnie, Jennifer's best friend. Both Luke and Bonnie happen to be visiting Stetson and Jennifer for Christmas and it's an unforgettable introduction for them. Neither knows about the other being invited, so when Luke has to use the bathroom that joins the 2 guest bedrooms, he has no idea that Bonnie is already in there. She is literally caught with her pants down! It's quite awkward with screaming and falling into the bathtub by Bonnie. Because of this Bonnie is very embarrassed to be around Luke at first but warms up to him once they spend time together. After getting over his shock at the crazy way they met, the first thing Luke notices is how beautiful Bonnie is. Because of abandonment by his mother when he was a boy, he is dead set against romantic relationships and emotional entanglements but he finds himself drawn to Bonnie in more than just a sexual way. A major blizzard hits and they are snowed in for several days, giving Luke and Bonnie a chance to grow closer to each other and making it almost unbearable when it's time for both to return to their own homes, Bonnie's being a 90 minute drive from Luke's. Luke doesn't reveal to Bonnie how he feels about her so she has no idea if Luke even wants a relationship with her. Has Luke changed his mind about getting emotionally involved? If so, can they make a long distance relationship work or will it prove too difficult? This was a really sweet love story about two people who really didn't like each other at first. After spending time together, and with friends during a Christmas snow storm, they fell in love. It was a quick, fun read and I would definitely recommend it. I voluntarily reviewed an Advance Reader Copy of this book.